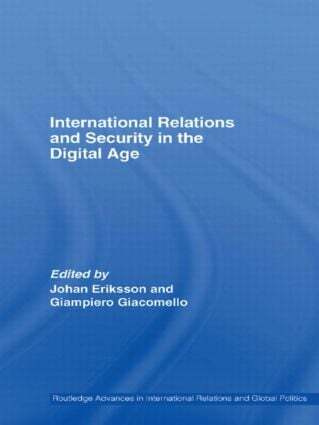 This book examines the impact of the information revolution on international and domestic security, attempting to remedy both the lack of theoretically informed analysis of information security and the US-centric tendency in the existing literature. International Relations and Security in the Digital Age covers a range of topics, including: critical infrastructure protection, privacy issues, international cooperation, cyber terrorism, and security policy. It aims to analyze the impact of the information revolution on international and domestic security; examine what existing international relations theories can say about this challenge; and discuss how international relations theory can be developed to better meet this challenge. The analysis suggests that Liberalism’s focus on pluralism, interdependence and globalization, Constructivism’s emphasis on language, symbols and images (including ‘virtuality’), and some elements of Realist strategic studies (on the specific topic of information warfare) contribute to a better understanding of digital age security. This book will be of interest to students of security studies, globalization, international relations, and politics and technology.